Join us this April for the Design-Build for Water/Wastewater Conference! The Opening Keynote presentation will feature Barry Gullet, P.E., Director, and William “Kit” Eller, P.E., Senior Project Manager, both from Charlotte Water. They will describe why Charlotte Water decided to use design-build for their first major municipal design-build project, the McAlpine Creek WWMF Effluent Filter Expansion Project. Also discussed will be how the project was implemented from beginning to end, lessons learned and how Charlotte Water intends to use the delivery method in the future. The 2016 Design-Build for Water/Wastewater Conference will take place April 20-22 at the Charlotte Convention Center in North Carolina. 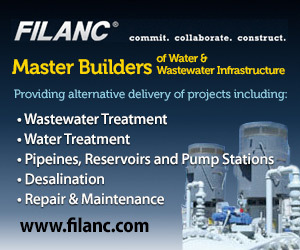 For more program information or to register visit: http://www.dbia.org/Conferences/water. A new report published by the National Cooperative Highway Research Program (NCHRP) highlights the issue of liability in design-build projects and was in part authored by two of DBIA’s most influential members and thoughtleaders. The report, titled Liability of Design-Builders for Design, Construction and Acquisition Claims, outlines case law and legal precedent that underlie the transfer of liability in design-build projects. Contributors to the report include Michael C. Loulakis, Esq., DBIA, and Nancy C. Smith, Esq., DBIA, who have contributed to DBIA and its vision as dedicated DBIA members. The General Services Administration moved the FBI headquarters project forward in a big way Friday, announcing that President Barack Obama's fiscal 2017 budget proposal will include $1.4 billion for the badly-needed project. Officials made the announcement in a conference call with reporters, saying they have issued the second phase of a two-step request for proposals to a short list of potential developers. That RFP uses a design-build approach in which developers will take all the factors of the existing site and new sites into account in their bids …"We believe that an exchange of the Hoover building, coupled with a design-build construction award for a full consolidation, represents the best approach for meeting the goal of a new headquarters and, at the same time, serving the taxpayer," Nathan said during the conference call. "We look forward to working with Congress to ensure that sufficient resources are provided." Long Beach, Calif. is pioneering a public-private financing method rarely used in the United States outside transportation in a $533 million project to build a new city hall, port headquarters, library and park. Instead of the city paying upfront to build the facilities and then paying for their operating costs over time, those expenses, along with design and construction costs, are all wrapped into "availability payments" the city and Port of Long Beach will make over a 40-year period. Developer Plenary-Edgemoor Civic Partners will design and build the project and then operate and maintain it for 40 years in return for the availability payments. The only other U.S. social infrastructure project that Ignacio Barandiaran, an Arup principal, said he is aware is the Long Beach courthouse (2014 DBIA Design-Build Project/Team Award winner) agreement the California state government entered into in 2010. I asked County CEO Jeff Smith (who is also a doctor) what he learned from the experience. His answer? The project delivery method was a major problem. County officials used a "design-bid-build" project delivery method, which is characterized by three sequential phases: Design a project, go out to bid for a contractor, then build it. Canadian governments’ standardized approach to public-private partnerships (P3s) is considered a model to emulate in the United States, where strategists are examining ways to boost that country’s stock of high-performance public buildings. The National Institute of Building Sciences (NIBS) and the Royal Institution of Chartered Surveyors (RICS) plan to release a joint report on P3 potential later this spring in an effort to encourage American policy-makers to move beyond the current limited use of P3s largely to build roads and other transportation infrastructure. As part of the research and consultation process, private developers, government officials, academics and industry consultants gathered in Washington, D.C. last fall to discuss opportunities and obstacles. A recently released summary of participants’ input outlined the anticipated public benefits of a design-build-finance-operate-maintain (DBFOM) model, in which private contractors would have a financial interest in delivering an energy-efficient, durable and adaptable building. When the State Highway Administration began building the Route 13 Bypass east of Salisbury in 1970, the modern cloverleafs, with their huge overpasses and efficient entrance and exit ramps, were the state of highway construction art. Now, 45 years later, many of those bridges would appear to be falling apart, so SHA will spend more than $20 million beginning next fall to rebuild 11 spans along the the north-south loop from Salisbury Boulevard near the Centre At Salisbury mall, all the way to Fruitland. The bridges were built in stages from north to south, beginning in late 1970 and continuing through 1975. A design-build project was advertised Dec. 29 for competitive bids from contractors. The bidding phase follows a project information meeting that was held for the public last fall. Lego wants someone to build life-size models in what could be the most desirable job on the planet. Merlin Entertainment, the owners of Legoland theme parks, have advertised for the enviable task of making a variety of structures from the famous toy bricks. They have reportedly hired 50 Lego builders already and are now looking for 20 more. CH2M recently announced the appointment of Leofwin Clark as president of the Water Design-Build Council (WDBC), effective January 1. Formerly, Mr. Clark served as first vice president and treasurer of the organization. A shortlist of three contractors among six who applied to construct the Gordie Howe International Bridge project was released Wednesday as the plan now enters its final bidding phase to select a winning builder. The three groups are listed as Legacy Link Partners, Bridging North America and CanAm Gateway Partners. The new Detroit River crossing project includes plazas on both sides of the border and new feeder road to connect with I-75 in Detroit. The Howe bridge is scheduled to open in 2020. A $50-million “early works” project to prep the site on the Windsor side started this past summer, while property acquisition is in full swing on the Detroit side. “With the short-listed respondents named, WDBA is pleased to have concluded the first stage in the public-private partnership procurement process,” said Michael Cautillo, CEO for the Windsor-Detroit Bridge Authority, the federal agency assigned to oversee construction of the bridge project. The 26th Annual Rockville (Maryland) Public Safety Awards recognize Shapiro & Duncan employees for saving a man's life after he was brutally attacked while leaving work. We recently looked at our data - compiled from thousands of organizations and applications, and millions of daily logins - to highlight the fastest-growing apps in our network from 2015. Some you'll recognize, others you might not, but all offer valuable tools for your business, which is why we think you'll see these apps even more in 2016. New member listing as of Jan. 26, 2016.